As the animal’s body ages, it goes through normal changes and often it is an accumulation of these changes that result in health problems. The most common problem that old dogs deal with is arthritis, and as older animals become less active they tend to become overweight. Extra weight places extra stress on already painful and inflamed joints. These patients might need to be X-rayed to rule out any other causes of limping and stiffness. Once a diagnosis of arthritis is made, the vet may advise a change in exercise regimen, a change in bedding, potentially a change of diet or adding joint supplementation products on to, or into the animals' food, and often anti-inflammatory medication depending on the severity. The most important method of pain relief remains weight loss. The organ function of old dogs often decreases as well. A common problem is decreased kidney function turning into chronic renal failure. As the kidney function decreases, it loses the ability to clear the animal’s blood of toxins. Some medications need to be excreted through the kidneys, and if the kidney function is already compromised, it can cause serious side effects. A good example of this is the anti-inflammatory medication mentioned for pain control in arthritic dogs. This group of drugs is excreted by the kidneys and will cause side effects if the kidneys are not functioning well. For this reason, vets will often test the liver and kidney function of old animals before placing them on chronic medication. It is also important to re-test every six months. Animals that suffer from kidney problems will show signs like weight loss and decreased appetite, as well as drinking and urinating more than previously. It is important to take your dog to see a vet as soon as these signs are noted. These days there are blood tests which can pick up kidney disease much sooner than the blood tests that were available only a few years ago. Yet, sadly, even though these tests are a lot more sensitive, they only pick up kidney disease once 40 % of kidneys are damaged vs the old blood tests which picked it up after 75% of the kidneys were damaged. Veterinary research will keep on evolving to find means of detecting organ failure sooner, but a test with normal results does not necessarily mean that there is not kidney failure. The other important aspect with regards to kidney failure is that the kidneys do not have the ability to regenerate or repair themselves. So, once the cells are damaged, that is it for the kidney. The only way to support the kidneys once damage has taken place is to try and prevent further damage and lighten the load of the kidneys. This can be done by changing the diet and there are specific veterinary therapeutic and prescription diets available for this which the vet can advise you on. Heart failure, as well as liver failure, can also occur showing a various range of clinical symptoms. With heart failure, your pet might be exercise intolerant, start with a cough (especially at night), and breathe faster in general. Another common problem in geriatric animals is cancer or neoplasia. As the immune system defence mechanism decrease, the ability to recognise cancer cells decreases, and together with oxidative damage in old animals, cancer can occur more commonly. Organ enlargement and organ failure are often an indication of cancer and the vet may recommend an abdominal ultrasound as well as x-rays to pick up cancer. Even the slightest signs in an old animal can indicate a bigger problem. Owners will often complain that the pet has become fussy, and eats less. But this can be the first signs to indicate that a bigger problem exists. It is important to remember that it’s not normal when an animal that has always eaten well, become fussy out of the blue. In most cases old age, as in humans go hand in hand with less active and a lower appetite, but a major reduction in appetite is usually a sign of disease. So how do you take care of geriatric animals? Feed a good quality diet: Old dogs cannot digest food as easily as young animals and they need all the nutrients and antioxidants they can get. There are various maintenance, therapeutic, prescription diets specifically formulated for older animals as well as animals with diseases like kidney failure, heart problems, and arthritis. These good quality foods help the animal cope better with their life stage or specific health problem. If there are no particular health problems, a good quality senior diet is preferred. Please speak to the vet to advise you and the best diet to feed your dog. 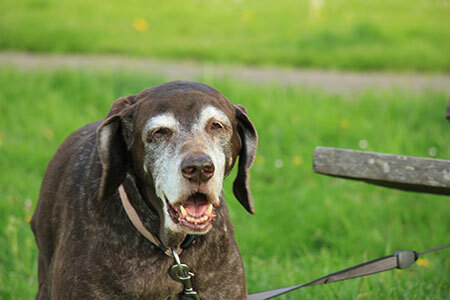 Keep their weight stable: With decreased metabolism and decreased mobility, older dogs tend to pick up weight quickly if they don’t have a chronic medical condition. Research has shown time and time again that obese animals have a decreased lifespan. Problems like diabetes and heart conditions are very common in obese animals. Encourage activity and moderate exercise: It is important to keep them active, but do not overdo this. Regular short walks are more than adequate and only do it if the animal is not in pain. Swimming in most cases is a really good form of exercise for dogs but not all dogs love water so go with the flow in terms of your dog’s preference. Good dental care: Dental hygiene is essential in animals of any age. If the teeth are rotten and the gums are inflamed, they may suffer from pain when they eat. The plaque build-up supplies the body with a continuous source of bacteria to the bloodstream. These bacteria can lodge on the heart valves or in the kidney tubules leading to chronic heart and renal failure. Provide adequate bedding and shelter: Older animals are stiff and sore and will sleep much better with a softer surface to lie on. They also lose the ability to regulate their body temperature adequately and may need extra shelter against heat, cold and other weather conditions. The most important thing to remember with geriatric animals is to bring them to the vet for annual check-ups. If the vet can help to pick up a disease in the early stages, they might not be able to cure it, but they can definitely make your pet more comfortable and even add a couple of years to your pet’s life by recommending the right geriatric care for your specific dog. Old age is not a disease! So if your animal is not eating too well and slowing down, do not just blame old age. Rather seek veterinary advice, you may just save your old dog’s life for a couple more years. © 2018 Vetwebsites – The Code Company Trading (Pty) Ltd.